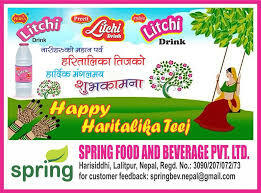 Company: Spring Food and Beverage Pvt. Ltd.
Qualification: Bachelor in food and Technology with 2 years of experience in Beverage Company or water Processing Company. Qualification: High school Diploma in Mechanical or CTEVT. Fresher can apply. Qualification: +2 completed in management with over 1 year experience in related field can apply. Experience: Minimum 3 years of work experience in beverage product. Interested candidates are requested to send their applications with current CV in [email protected]or you can contact on 9813360792 no later than April 25, 2019. Only short listed candidates will be contacted for recruitment process.